How it was meant to be! gTunes is the best Google Music player experience possible on your Mac! 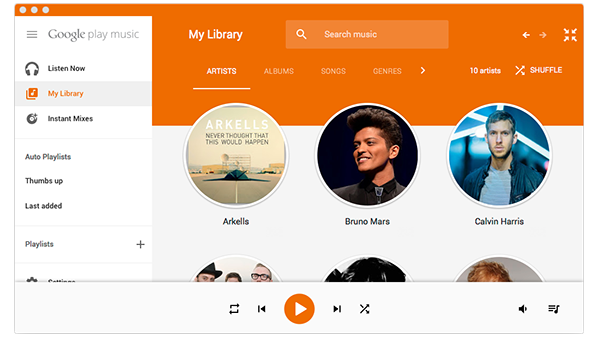 Mini Player mode, Media keyboard support (Next/Previous, Pause/Play), and Now Playing Notifications take Google's player Google Music allows you to keep up to 20,000 of your favorite songs in the cloud for free! gTunes is based off of Google's already excellent interface. They brought us most of the way, but we add just a little bit more magic to your music player! Essential controls in a compact player stay out of your way and let you get some serious work done! Always be informed of what's playing, even when your window isn't visible! Quickly control your tunes with your Mac keyboard's Play/Pause, Next, Previous and volume keys! Share your experiences through Last.FM with Scrobbling and Now Playing support! If you subscribe, listen to your All Access pass from Google! I finally feel like Google Music is now a first class citizen on my Mac! Thanks! The interface is familiar, but the keyboard controls and notifications make it so much better! Mini Player is awesome!